Slugger and Astro had echos of their heart done the day they were born and everything looked A-okay. 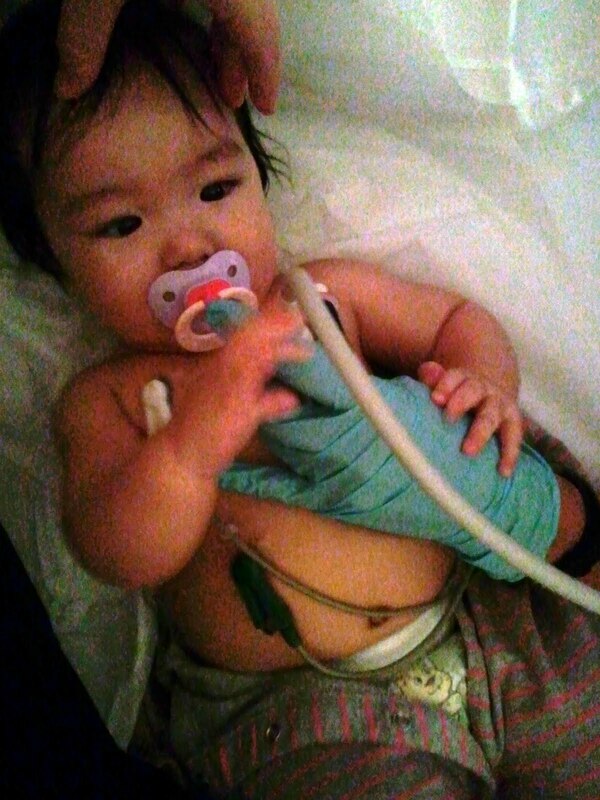 But right before Slugger's discharge from the NICU, they detected a heart murmur which led them to discover she had a small hole in the septum (wall) between her left and right atrium chambers. ASD, atrial septum defect. We were told to watch her and they would check close to her first year. Dr. S. told us that it was very likely the hole would close on it's own. So, we've been waiting and waiting and we finally got to take her in for her follow-up with the cardiologist. This is Slugger pre-appointment. 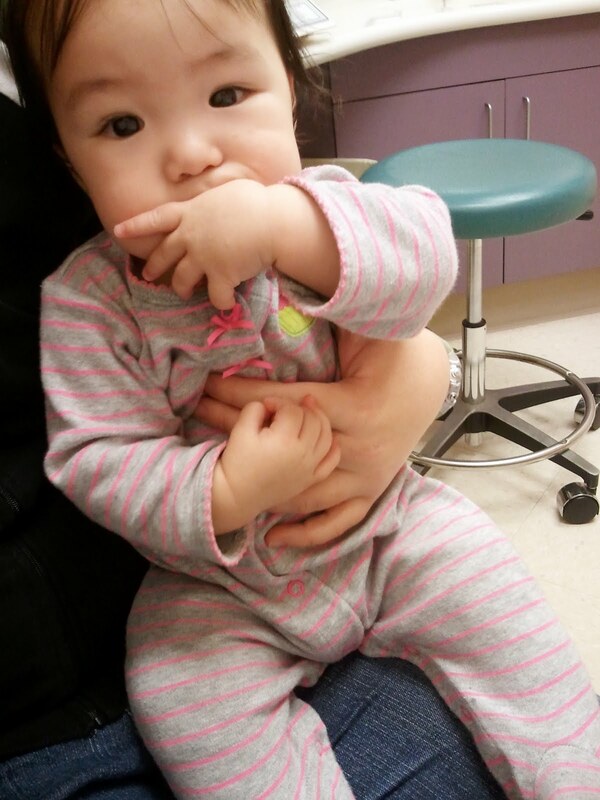 She's calming herself with a few good chomps on the thumb. The doctor listened to her chest with a stethoscope and told us it sounded good. Stethoscope? That's it? We've been waiting for months, where's that ultrasound machine you call an echocardiogram? Well, apparently, they can't usually do echos on such small infants because the babies won't lie still for them. 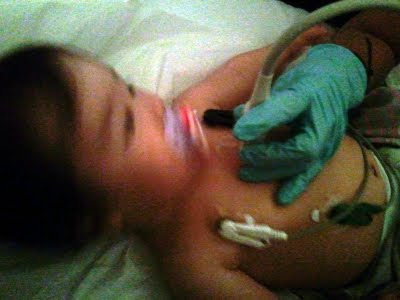 They have to sedate the babies which, of course, we don't want to do. The doctor said "well, maybe we can try..." YES!!! I'll keep her still. So they took us into that dreaded room. That part wasn't fun. The room that I was in when a man in a white coat with kind eyes told me that my little girl was dying. That room that I still had to spend hours in every other week while they watched Rory grow and develop. I have every inch of the wallpaper border memorized, every bulletin posted on the wall. It was weird to return to that room. That room was also my quality time with Rory. They barely scanned Astro and Slugger. Instead, it was just 45 mintues of doing nothing but watching Rory jump around, getting elbowed in the head by some sister (usually Slugger). Slugger had to lie down for her echo so I snuggled up beside her to try to keep her still. We gave her the pacifier (which we usually save for the emergency public breakdowns) and I let her watch videos on my phone. Sadly, the only thing I had was the movie Avatar which came with the phone. I don't even like the movie. I just replayed the parts that had the forest scene with glow-in the dark plants. Surprisingly, she watched it calmly. Slugger did so good. Yes, she might have pulled on the probes a little and taken one off. 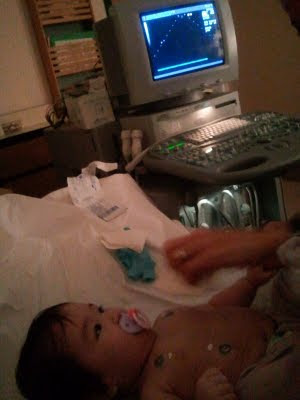 Yes, she tried to take over the ultrasound wand drifting over her chest, grabbing it and pushing the tech's hand away. But after her curiousity wore off, she calmly lay there...even falling asleep for a bit. That's my girl!!! Just as the tech was finishing, Slugger woke up and firmly pushed the wand away. She knew time was up. Excuse the grainy pictures, the room is kept very dark. The doctor came in to talk to us afterward and Scott said as he saw the doctor coming towards us "It's never a good sign when they're bringing a model of a heart with them." Too true. Bad news: the hole is still there. The good news: It's tiny small. There's still a chance that it may close up on it's own. Usually, if they're going to close up, they'll do so by 16-18 months of age. It is also so small that it's not affecting her. There's no enlargement of any chambers, no leakage, her lungs are clear. Even if it never closes up, as long as it doesn't get larger, we still may not ever have to address it. The doctor said she can play sports, she can go on to have children of her own. So, we'll check again in another year and half. The doctor insisted that since she's so young that it may close up, he can't even really truly diagnose it as a heart defect yet. He clearly said repeatedly to treat her normal. I don't know what meant exactly in reference to a 9 month old baby. She's not ordinary...she's extraordinary. 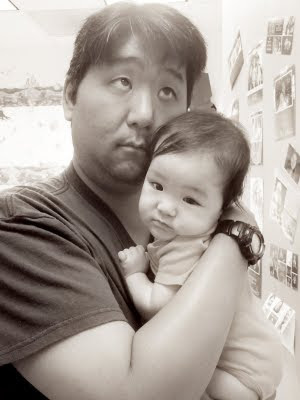 Here's baby and daddy post-appt. It was a long appt. 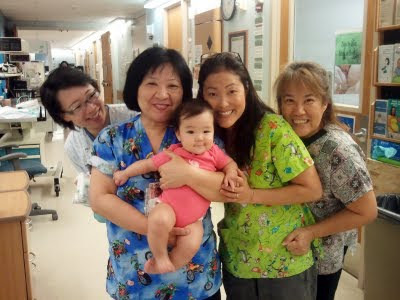 But Slugger cheered up immediately when we stopped by the NICU and saw her aunties: Alex, Amy, Aileen, and Dina. Robin, Dr. Chiu, and Laura came outside after the picture was taken. Read how numerous organizations have become household names for our family in this blog entry and why we are so excited to be able to give by participating in the March For Babies. And please visit our March of Dimes pages to support us in our walk to battle birth defects, premature birth, and infant mortality. Poor Alex, always getting mistaken for Annie. Seeing our NICU nurses was a great way to end a long doctor visit.